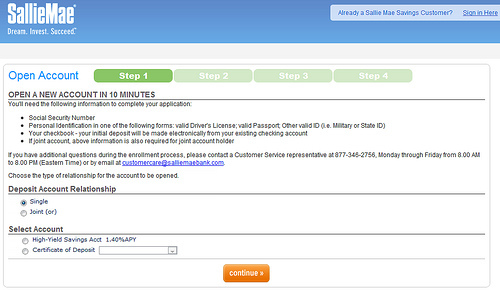 The account opening process is rather straightforward, taking only about 10 minute from start to finish. Like many other banks which offer account application online, the process of opening an online savings account, including Sallie Mae Savings Account, is pretty standard nowadays: Select the account type, provide personal information, set up a user name and password to access account later, verify identity, choose account funding method, and create online account access. For SallieMae account, there’s no paperwork to be sent back to the bank. All were done online. During the process, you will be asked to provide external bank information to make initial deposit (though no minimum deposit is required for this account) and any subsequential deposits that you may want to add to you account. ACH fund transfer, which is done by linking your savings account to an existing checking account to transfer money back and forth, is the fastest and easiest way to fund your Sallie Mae Savings Account or withdraw money from it. Therefore, it’s recommended the external bank link be set up at the account opening to speed things up.